Tonight’s post is about another custom card order that is in the mail: five masculine thank-you cards for recipients who helped the sender move. I detail my initial process and then focus on the first card at the bottom. 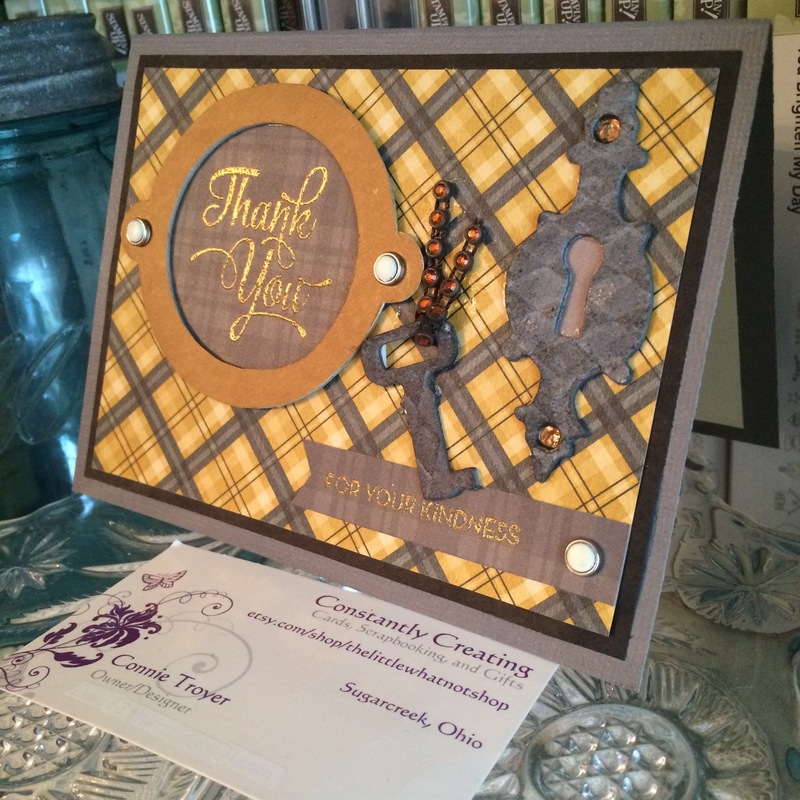 Ask any cardmaker: masculine cards are challenging. Floral, pretty, girly prints are easy to work with; there’s masses of material out there and a lot of designers are women, so they create what appeals to them. (I’m thankful for those who deliberately go in another direction for more options.) So what do we have available for masculine cards? Plaids. Varying fonts. Gender-neutral items. Solids. Strong colors. Bold prints. Fishing or hunting. Cars, bikes, trucks, tractors, all manner of machine… Mustaches. Video games or comp sci/techs stuff. Math…? Okay, that may be stretching it. But you see what I mean. It’s not easy to come up with a lot of variety. And I was supposed to find something for movers. I picked keys, thinking house, and my guy go-to, plaids. Maybe plaids aren’t a normal “guy go-to” but I grew up buying “real” flannels for my dad every other year, so for me, it’s a given. I’ll confess, I was really struggling with these cards. Sometimes the simplest ones are the hardest. The thank-you cards that fell together the best were the plaids, which had nothing to do with moving – but the paper had landed on my desk and I couldn’t stop looking at it. And I had a design in my head I wanted to do with the DCWV key paper, but I couldn’t get the sizing to work right with the large stamp I wanted to try (which had been approved by the sender). I also wanted to make them nice and had to make the sentiment show up on the matching darker paper, so heat embossing seemed the way to go. One challenge after another. 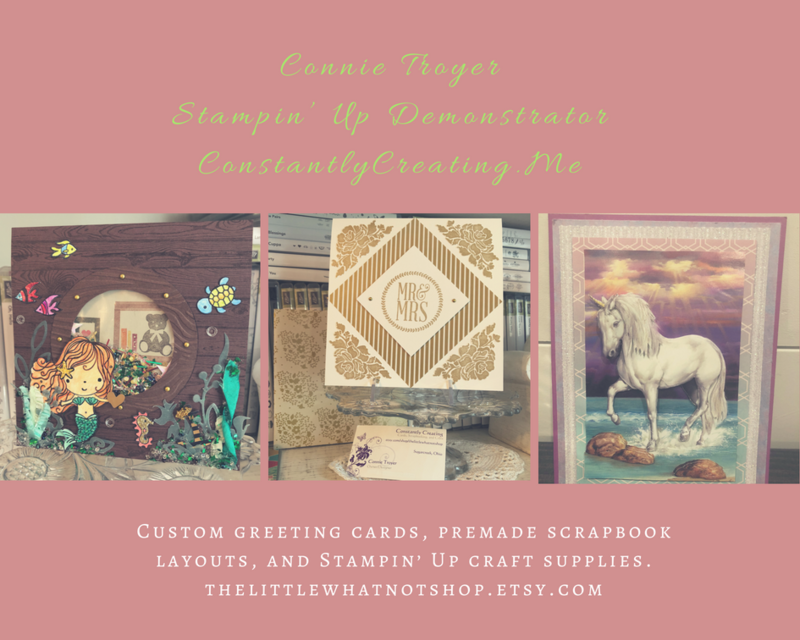 I finally conceded that the sizing just wasn’t working with the usual A2 card base, so I switched to another (smaller) thank-you sentiment for half of them and then grabbed a couple of premade cream 5×7 card bases for the bigger sentiment just so I would make some progress. I find I create cards much faster and easier when I’m throwing random bits around – things that happen to be laying on my desk that I need to put away…or I’ll look up at my pegboard spinner and focus on some item hanging there that’s never been a focus before and I suddenly know exactly what I want to use it for. Sometimes when I’m trying to feel my way around a vague idea, I find myself pulling out papers and fun embellishments that seemingly have nothing to do with each other. It’s like a stress relief…or maybe just a perfect stalling technique. But somehow all that creative “mess” often turns into a card, and usually rather quickly once it’s in front of me. I’d already pulled five A2 (4.25″ x 5.5″) card bases for the new order. When I was thinking through this key paper/mover problem, I was cleaning up my desk and floor from the love stuff – I work out mental problems best by cleaning – and I stumbled upon that yellow/grey plaid paper (Stampin’ Up brand). I had one 6×6 sheet of it because I had no idea which paper pack I’d pulled it from besides “Christmas.” But it matched one of those card bases perfectly, which isn’t easy to do when you’re not using coordinating products, so I had to either use it or set them both aside for another day, another card. And I really don’t need anything else sitting out to use “later” (I already have another 10-15 cards in pieces that I never got to make for the love order before I ran out of numbers). So using it was a given. And then I sat there and stared at it. The key paper (brown/gold) didn’t match. Nothing else matched. How could I do both browns and greys and make it look purposeful? Ugh. I ended up matting the paper with a random lightweight black piece that was also on my desk and went the gold/grey route instead of browns. The goal was to keep the cards flat (so they would be easily mailable and not cost extra postage) and simple (because simple is the preference of this sender and, well, they’re for a bunch of guys who aren’t going to care anyway). I finally reconciled myself to using the smaller sentiment, and then it was just a matter of filling the space left over. That’s where the rummaging bit comes in. I knew I had some key embellishments, so I started digging in my “fun” drawers. But I needed them to stay flattish. It turned out that the Tim Holtz grungeboard keys worked best for the requirements, though I’d need to change the color of them. I didn’t want to use the only two I had on one card, so I settled for a keyhole plate as a companion piece to the smallest key and grabbed some Distress Inks to dirty them up a bit, as the original grungeboard color was too light to match. She gave me a few instructions, so I gulped and tried to do what she said. Got out a little cup of water and a paintbrush beside the two colors I chose (Iced Spruce and Black Soot) and hesitantly started trying to combine them on top of the grungeboard – and the edges, later. I’m not altogether sure I did it the way I was supposed to, and I went back once after it was half dry and added more, but I like the result. And then I bounced over to do some editing while I waited for it to dry fully. I was still thinking through the rest of those thank-you cards. After the key/plate set was done, the rest was easy. Candy brad bases, pushed through the paper to hold the sentiments (Stampin’ Up, retired), Dark Chocolate Liquid Pearls (Ranger), double-sided matching paper behind the keyhole (K and Company), and gold embossing powder (Hampton Arts) for the sentiments. I thought about running a ribbon behind everything to tie it together but didn’t like the placement of the key with it, and I worried that it would make things look too congested. I’d found a miscellaneous round raw chipboard frame (possibly Colorbok?) while I was digging in my embellishments that fit the smaller sentiment perfectly. I covered it with gold metallic paper from DCWV…and I used the flip side of the keyhole paper from K and Company behind the frame and for the small banner that held the second part of the sentiment, “for your kindness” (also previously approved). Plaid again, of course – it matched. 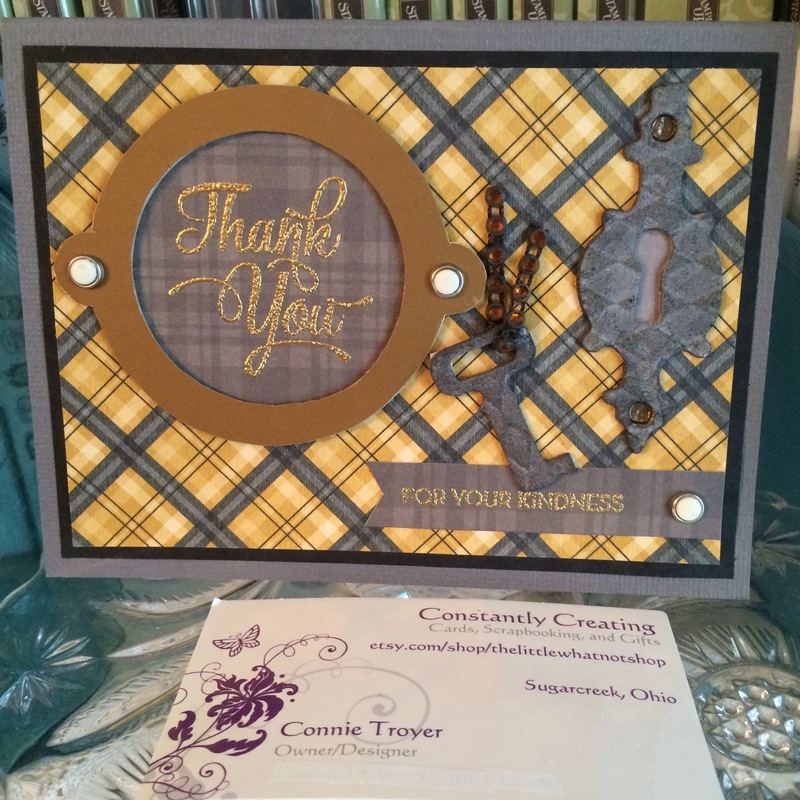 Both sentiments are from Stampin’ Up (“One Big Meaning,” current, and “So Very Much,” SAB set, retired). I had the perfect ribbon that reminded me of a chain and it even matched – the idea came to me as I was doing the dishes. No idea who makes it, but I love it. I had to pop up the key a bit with a 3D foam dot because of the ribbon (that I also had to cut to lay flat).